Types of naturalization are different according to the conditions. As I mentioned in the last post, there are three types of naturalization. The conditions of naturalization make them three different types. Permission of naturalization is up to the discretion of the Minister of Justice, and the decision whether it is approval or not will be made. There are seven conditions, and I will explain them on the next post, but in principle, the case that meet these all seven conditions is called as Normal Naturalization. In articles 6 to 9, the cases where the conditions will be eased according to each applicant’s personal situation are stipulated. 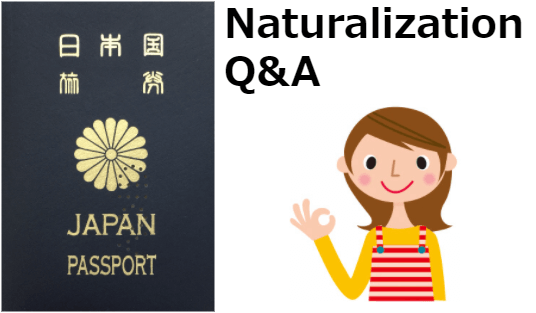 When you apply for naturalization under the eased conditions bases on from article 6 to 8, it is called as Special Naturalization, and when you apply based on article 9, it is called as Naturalization granted for special contribution to Japan. The conditions of Japanese nationality are stipulated in Nationality Law based on Japanese Constitution article 10. 1 Nationality is the qualification to be a member of a certain country. 2 The laws or the treaties of the country stipulate the conditions of getting or losing one’s nationality. 3 As to getting nationality, there are two types; inborn or acquired nationality. 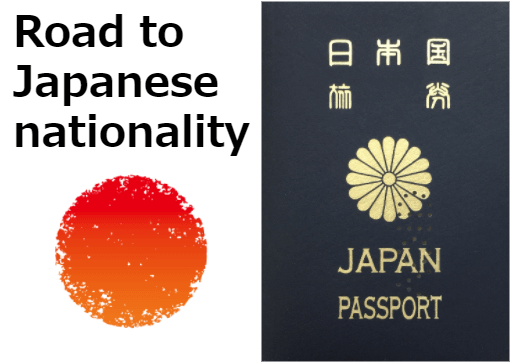 4 Reservation of Japanese nationality will be applicable to those who have dual nationality due to Japanese blood born outside Japan. 5 Those who have dual nationality must choose either of nationalities within a certain period after they become adult. Among above five points, “inborn or acquired nationality” has a great relation with naturalization procedure. The definitions of inborn or acquired nationality are as follows. A person who is not a Japanese citizen may acquire Japanese nationality through naturalization. To undergo naturalization, permission of the Minister of Justice shall be obtained. Naturalization is based on permission of the Minister of Justice on an individual basis, and is based on your own will, which is called Acquired nationality. In Nationality Law, it stipulates the condition and sort of naturalization. From article 5 to 9, three types of naturalization are stipulated. In naturalization procedure, there are many laws you have to consider. You can probably imagine Nationality Law, International Private Law and Immigration Control and Refugee Recognition Act as laws that connect with naturalization procedure, to some extent. Other laws are used when checking if you meet the conditions of naturalization. When foreign nationals who have been living in Japan for some reason want to get Japanese nationality, they can get it by applying for it and surrendering their own original nationality. Naturalization is that giving up their own nationality and getting another country’s nationality. Applying for it is called Application for permission to naturalize. Application for permission to naturalize will be done by foreign nationals themselves who have the will of naturalization. The percentage of getting approval for naturalization would be high, if you meet the conditions of naturalization. However, when there are questionable points to meet the conditions, your application would end up in failure, so, you have to consider carefully in advance. Nationality is the personal qualification of becoming a member or constituent of a certain country. Therefore, you can say it is personal status or eligibility. If you get Japanese nationality, wide variety of legal relationships will arise among you and Japan. First of all, you can point out “RIGHTS AND DUTIES OF THE PEOPLE” stipulated on Japanese Constitution. Especially, among these, the right to reside domestically and the right to vote are the rights that clearly depend on having nationality. Specifically, Nationality Law stipulates the conditions of Japanese nationality. In the current law, you can get Japanese nationality by two ways; birth and naturalization. In America, France, Brazil, etc., they take the system which grants the nationality to all those who are born in their territory. This system is called “the principle of birthplace”. In Japan, in principle, based on parent‐child relationship, as long as either father or mother is Japanese national, even if the child are born in or outside Japan, the child will get Japanese nationality. This is called “the principle of lineage”. Japan also supplementary adopts “the principle of birthplace”. In this test, they will ask you about mainly the contents of the documents you submitted to them. They will ask you especially about traffic accident, violation of traffic regulations, criminal record, family relation such as your spouse, parents or children, living situation, your business, etc. Not to mention the documents, you must not tell a lie in the interview test as well. You can say that false declaration would cause trouble to every direction and that it would not only prevent smooth process, but also lead to disadvantageous result. If you manage to get over the interview test, and application is approved, they will publish the result on Official Gazette. You will get the notification of approval from the head of Legal Affairs Bureau. After this, there are many requirements you should do, but if you follow the direction of Legal Affair Bureau, you can do it for yourself. They are so easy, so you don’t need to worry about it. As to your new copy of family register, you can get it in a week or so. When your case is disapproved unfortunately, they will send the notification of disapproval from Legal Affairs Bureau to you. 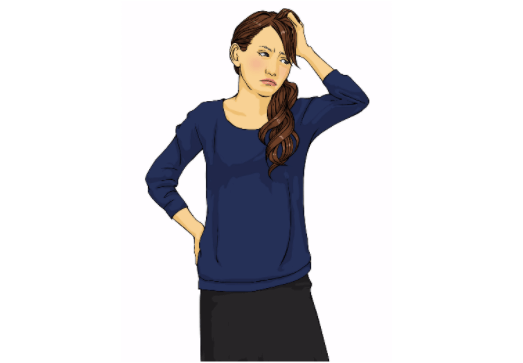 What should you do when you get the disapproval? Let’s confirm the reason of disapproval. In principle, they will not tell you the reasons, but they might tell you how long you have to wait for reapplication when the result of disapproval were due to traffic accident, violation of traffic regulations, criminal record. You will get the result of approval after six months to one year from the day of application. Therefore, the total amount period of time will be from one year to one and half a year including collecting and preparing documents from the time when you decide to apply for naturalization. Jurisdiction of application for naturalization is not Immigration Office, but Legal Affairs Bureau. Let’s get started to call nearest Legal Affairs Bureau to reserve consultation. In some Legal Affairs Bureaus, you can consult them without reservation, for example Osaka, but, to make it smooth, I suggest you call them in advance. 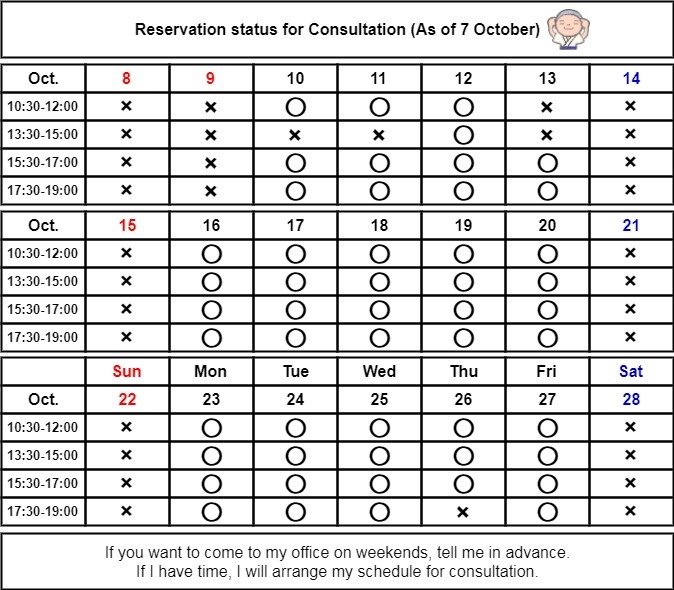 There are cases where you have to wait for almost one month to take consultation. By consulting with the person in charge, you can check if you have your eligibility for application for naturalization. Also, they will tell you what documents you have to submit for application. Required documents and certificates vary from person to person. Salaried workers, Business owners, Family relations such as married, adoption, etc. Therefore, Kind of documents and total pages also vary according to the cases. If you get the information about the required documents after consultation, then let’s start to collect them. There are some people who might think it is OK just to request them to City Hall and collect them, but there are the documents you need to request to your own country. It might take more time and trouble than you think, because there is often a case where you don’t realize the incorrectness of them until getting them. I am getting livelihood protection（生活保護） now. Can I apply for naturalization? In my opinion, you can’t. Receiving livelihood protection means you can’t make a living by the income or assets of yourself, your spouse, and your relatives. Therefore, the fact of getting it means you can’t meet one of the conditions of naturalization, so, if this status continues, it would be very difficult to apply for it. 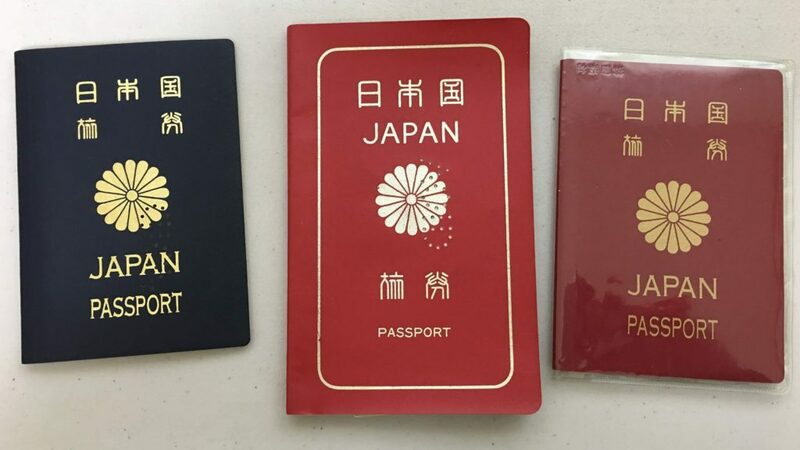 In principle, in my office, if you want to apply for naturalization, you have to communicate with me in Japanese, because naturalization means getting Japanese nationality and you do need to have the basic level of Japanese language. However, I’d like you to know what the “naturalization” is, so, on this page, I will provide you with the information in English. 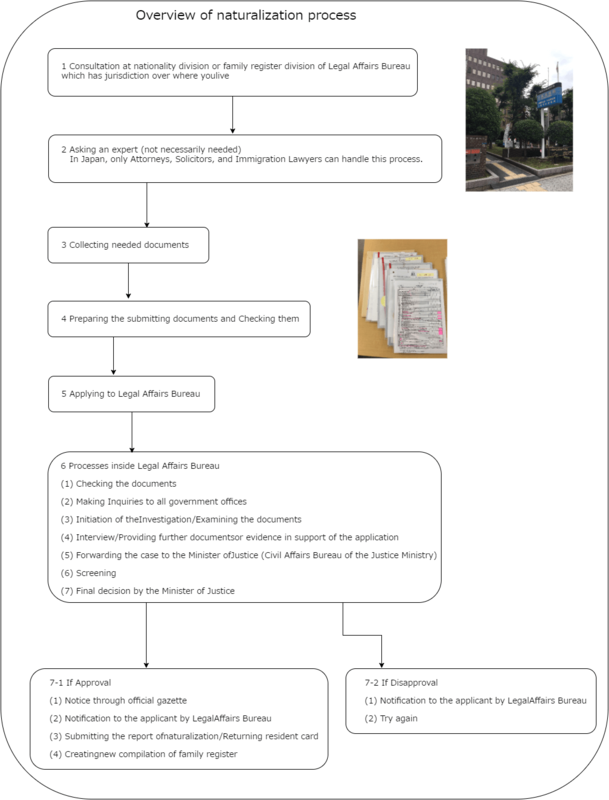 Let’s look at Overview of naturalization process, firstly. 2 Asking an expert (not necessarily needed) In Japan, only Attorneys, Solicitors, and Immigration Lawyers can handle this process. There is a case where a person who want to divorce submit the divorce paper without the consent of its partner, when the talks between them does not go well. Once the divorce paper is accepted, it will need court procedure to make it annulled. This is time consuming and requires a lot of energy. To avoid this, there is a system that you can request them not to accept the divorce paper. Today, I’d like to explain about this. Divorce paper will be easily accepted when you fill the form and submit. To submit it, either husband or wife can do it, that is to say, they don’t need to do it together. They do not check whether the signature on the paper is done by them. Also, unregistered seal is allowed to use on the paper, and you are not required to submit certificate of registered seal. So, there are sometimes cases where one of a married couple fills the divorce paper without its partner’s consent. To prevent this, there is the system of requesting to municipal office for not to accept the divorce paper. When they accept this request, even if he/she submits the divorce paper, it will not be accepted. In principle, you should submit this to the heads of municipalities of your partner’s registered locality or 本籍地（ほんせきち）. You can submit this to other offices than that of registered locality. However, in this case, the office that receives your request should send your application form to the office of your partner’s registered locality, therefore, there takes a little time, and during this time, there may be a case where the divorce paper is accepted. To avoid this risk, it is better to submit it to the office of your partner’s registered locality.